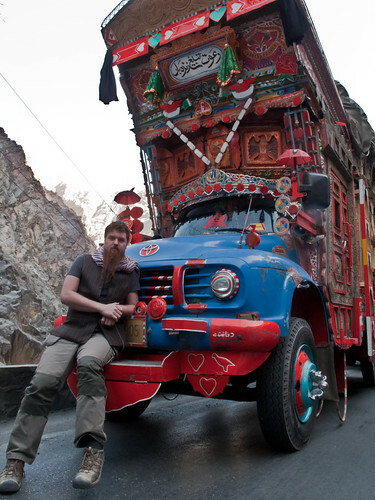 The ride from Kabul to Jalal­abad was long and adventurous. 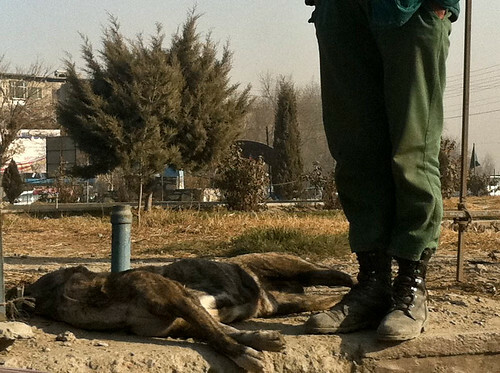 I saw a dog being killed in Kabul. They are con­sid­ered pests here. 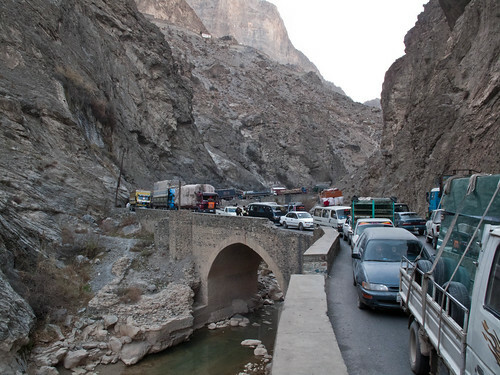 Most of our drive time was spent sit­ting in traf­fic on the windy seg­ment of the Kabul River Gorge (also called Tangi Gharu). 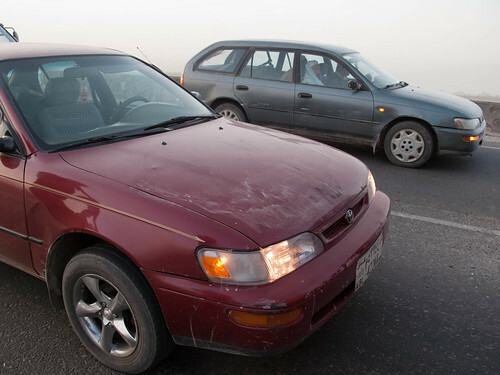 Part of the rea­son for the bad traf­fic is that peo­ple tend to drive on both sides of the road in both direc­tions. At first it seems like a good idea, you get a lit­tle bit ahead of your neigh­bor. But local opti­miza­tion can some­times lead to global cat­a­stro­phes. Such deci­sions cre­ated grid­locked jenga puz­zles on nar­row roads with pre­car­i­ous drop offs and small mar­gins for error. Each one took hours to resolve. When­ever we’d show our faces, a crowd would appear. The younger ones talked to us. Some­times they asked for “energy” = soft drinks. 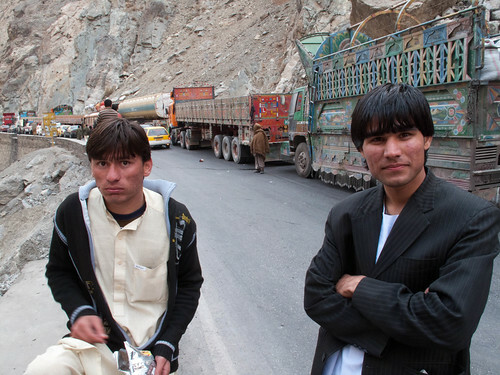 I met a boy named Pamir who is studing law, on the right. He’s gonna be a bureau­crat some day. 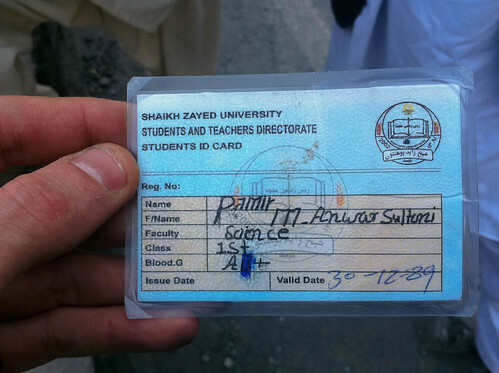 On his stu­dent card, you could see his blood type. Out of the gorge we were out in broad open val­ley swept by opaque dust storms, bend­ing trees horizontally. The road had warn away in parts, and you have to be ready to stop abruptly when you spot a pot hole. This caused our acci­dent. A truck in front of us stopped. We stopped right behind it, and many cars stopped on our bumper behind us… So far so good. But the truck in front started back­ing up. We honked. It didn’t care. It ate half our hood before it finally stopped. 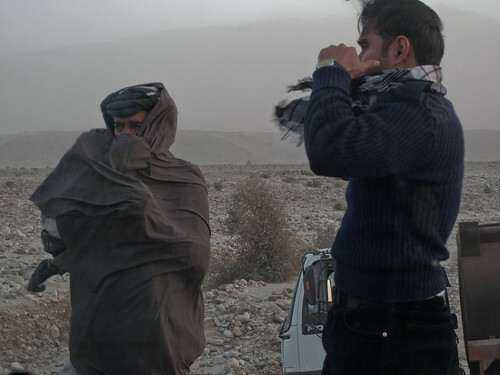 One amaz­ing thing about Afghanistan is the jusx­ta­po­si­tion of the past and the future, and how one causes the other. There is no postal ser­vice, for exam­ple. You have to rely on email. There will prob­a­bly never be a wired tele­phone net­work here, but every­one has a cell­phone. 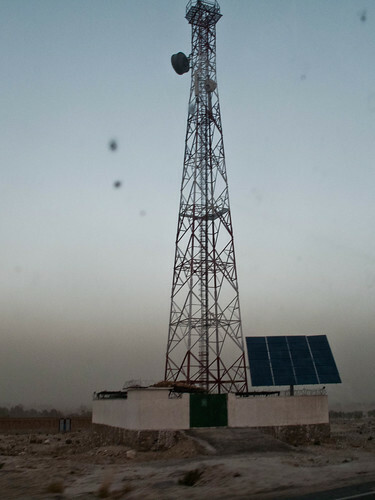 Cell­phone tow­ers (when not pow­ered by gen­er­a­tors) are pow­ered by solar. We did see con­struc­tion crews lay­ing fiber optics cable along the high­way. Sadly, I missed the photo op. Maybe Lou or Todd got it? 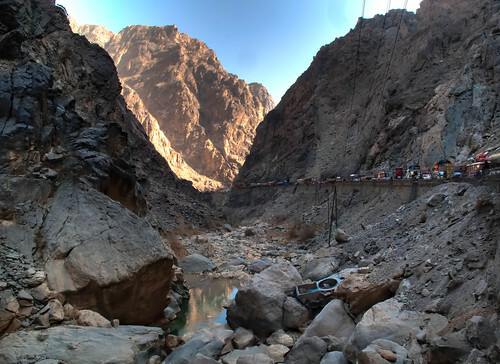 Much of the country’s hydro­elec­tric facil­i­ties are located along this stretch of river, so the fact that the Kabul river is but a stream, presents a problem. Approach­ing Jalal­abad, we pass the Darunta Dam and afte­wards is Nan­ga­har Uni­ver­sity whose ini­tial build­ings were used to house the Soviet engi­neers that built and oper­ated the Darunta Dam. Right before you breach the perim­iter of Jalal­abad city proper, take a left down Awe­some Todd’s road (see Open Street Maps). Wel­come to the Taj. This has become our home (Lang­ton Annex More about the Taj and its occu­pants in another post. This is part of the longer nar­ra­tive blog series, that started with What is Nor­mal any­way? I will try to have this sub-series fol­low a liner nar­ra­tive, while the gen­eral post stream will jump around. kinda like rush hour traf­fic in LA… with scenic vehi­cles and booby traps instead of speed traps. wow, those trucks are ready for burn­ing man! Can you bring one back? Also, how did nego­ti­a­tions go with the truck driver? We didn’t han­dle the nego­ti­a­tions and they didn’t end right there. They made a date to nego­ti­ate fur­ther by the side of the road. After our dri­ver dropped us off, he went to the des­ig­nated place to con­tinue nego­ti­at­ing. If I see him again, I do intend to ask. just see­ing this post now and I was going to say the same thing. 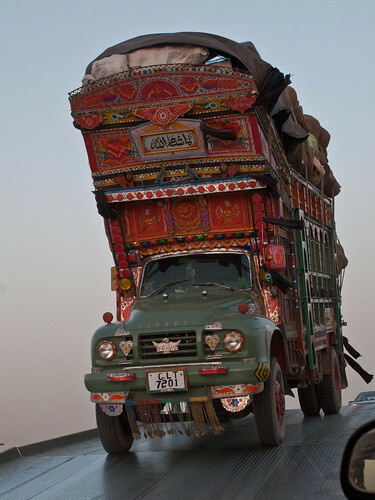 I would like a jin­gle truck for my birth­day, if you could fit one in your bags please.